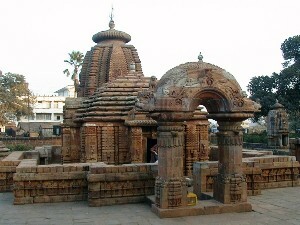 Mukteshwar temple, one of the most prominent temples of Bhubaneswar, has been constructed in the style that is quite similar to the one used in the Kalinga School of Temple Architecture. The splendid Torana of the temple, an ornamental arched gateway, is very much reminiscent of the influence of Buddhism in Odisha. Established in the year 950 AD, Mukteswar temple is dedicated to Lord Shiva. Its major highlights consist of the exquisite carvings that depict ascetics in different meditative pose. On the eastern side of the temple, there is a large well. It is said that, taking a dip in the holy well cures a person of infertility. Mukteshwar temple exudes magnificence and delicacy. It is a perfect blend of ancient and modern designing and this is what makes it simply outstanding. This architecture is one of the basic reasons why Mukteswar temple is also known as the 'Gem of Odisha architecture'. It has undergone a dramatic makeover, but still retains its essence. The temple stands within an octagonal compound wall that is based on the lines of structures built in the bygone times. However, today, the wall has been reduced to nothing more than small fragments.